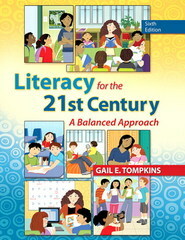 Literacy for the 21st Century 6 Edition This title is also available packaged with the Enhanced Pearson eText. To order the Enhanced Pearson eText packaged with a bound book, use ISBN 0133388263. Literacy for the 21st Century: A Balanced Approach is a thoroughly applied text written to ensure that readers understand the current theories behind and the critical components of instruction for teaching reading and writing as complementary in the development of literacy. Readers are treated to a philosophical approach that not only balances the why, what, and how of teaching literacy but also offers practical pedagogy—teaching strategies and instructional procedures—that foster thoughtful teacher preparation and ensures alignment to the literacy goals teachers are responsible to teach. New text features model practices that support diverse populations, instruction driven by sound classroom assessment, and new literacy strategies that will help teachers transform literacy learning with digital devices. Integrating the best of what we know about teaching reading and writing, the Sixth Edition of this popular introductory text provides the balance teachers need to be successful in the classroom. The Enhanced Pearson eText features embedded video. Improve mastery and retention with the Enhanced Pearson eText* The Enhanced Pearson eText provides a rich, interactive learning environment designed to improve student mastery of content. The Enhanced Pearson eText is: Engaging. The new interactive, multimedia learning features were developed by the authors and other subject-matter experts to deepen and enrich the learning experience. Convenient. Enjoy instant online access from your computer or download the Pearson eText App to read on or offline on your iPad® and Android® tablet. * Affordable. The Enhanced Pearson eText may be purchased stand-alone or with a loose-leaf version of the text for 40-65% less than a print bound book. * The Enhanced eText features are only available in the Pearson eText format. They are not available in third-party eTexts or downloads. *The Pearson eText App is available on Google Play and in the App Store. It requires Android OS 3.1-4, a 7” or 10” tablet, or iPad iOS 5.0 or later.